Birds can chirp, wolfs howl frighteningly and frogs croak happily together, but we humans possess various musical possibilities. We can choose between tone height, timbre, rhythm etc. consciously and play at will. We people are the only creatures, who can make music willingly. In addition to this, we aren’t satisfied with our physical possibilities like singing, flicking with the tongue, clapping our hands and stumping with our feet. We use different materials to play music with. Gut, hair, skin, wood, reed, metal, glass, wind, water, electricity… Too much to sum up all there is. The use of all those different materials led and leads to this immense flood of various music instruments. Musicologists have found with great difficulty and during many discussions to bring order in this sheer chaotic diversity of musical instruments. 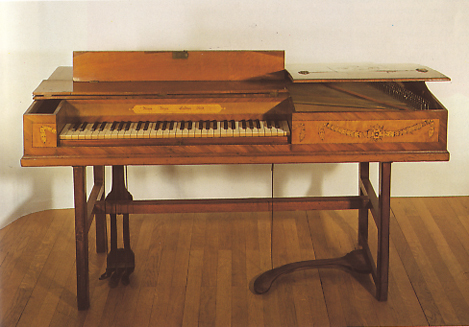 The result is, that the (upright) piano and its predecessor, the harpsichord (and later the piano in its long form) as well as the clavichord (later the square piano), regarding its construction, that it was naturally assigned to the group of string instruments, but subsequently it was assigned to the group of zither instruments. It is a characteristic for the method of construction for zither that the level of the strings runs parallel to the plane of the sound body. Other known instruments of this category are the dulcimer, psaltery and the cimbalom, which was popular in Danubia. The sound of a cimbalom reminds of the sound of an antique piano. Mechanically plucked psalteries are known since approx. 1375 ad. It led to the development of instruments like the harpsichord, spinet, virginal and the muselar. On the other hand we know of mechanically stricken psalteries since approx. 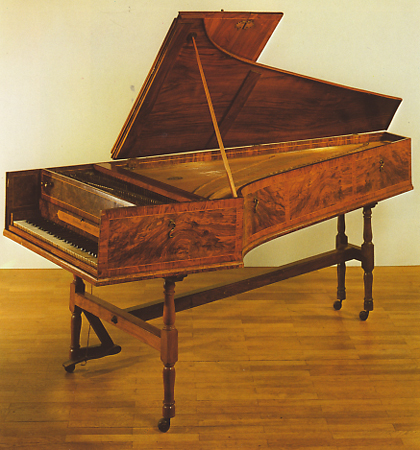 1710 ad (Bartolommeo Cristofori, Florence): the fortepiano. Another attempt of Arnout van Zwolle approx. 1440, the dulce melos, received no successor. 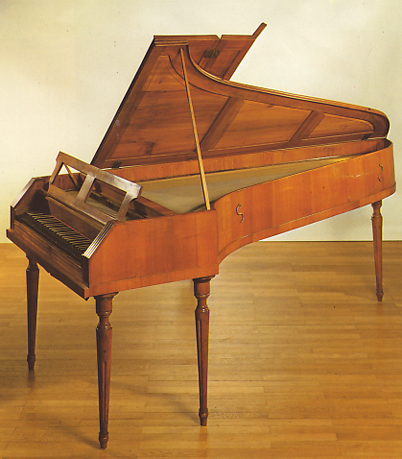 Cristofori presented his invention as “gravicembalo col pianoforte” (literally: harpsichord with silent and loud). 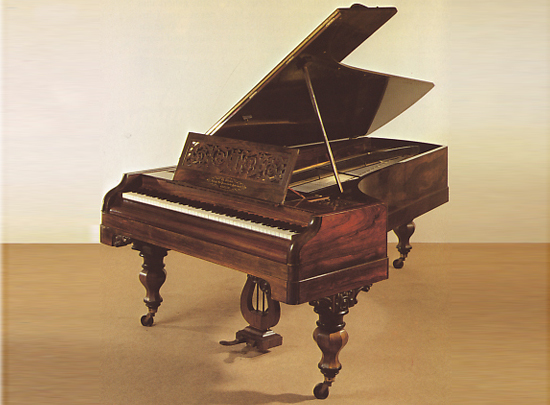 With this instrument – the prototype of the piano –, the strings could be hit lighter or harder. In the museum for music instruments in the University of Leipzig an original instrument can still be found. Until well into the 18th century the German term for piano („Klavier“), which was often written as „Clavier“, was used as a collective noun for various keyboard instruments like the organ, the clavichord and the harpsichord. This becomes clear if you look at J.S. Bach’s “Clavierübung” (piano exercise). This work consists of four parts. The first part itself consists of six partitas, which can be played both on the harpsichord as well as the clavichord. The second part (the “Italian concert” and the “Partita in B minor”) has instructions for manual changes and should be played ideally on a harpsichord with two keyboards. The third part consists mainly on chant adaptations for the organ with and without a pedal. The fourth part, the “Goldbergvariations”, is specifically written for a harpsichord with two keyboards. In 1783 C. Ph. E. Bach released in his own publishing company a collection of piano music with the following title: “Clavier Sonaten und Freye Fantasien nebst einigen Rondos fürs Fortepiano für Kenner und Liebhaber” (Piano sonatas and free fantasies besides some rondos for the fortepiano for connoisseurs and lovers.). The term “Clavier” refers in this case to the clavichord. The (forte)piano is already at this point being indicated separately. 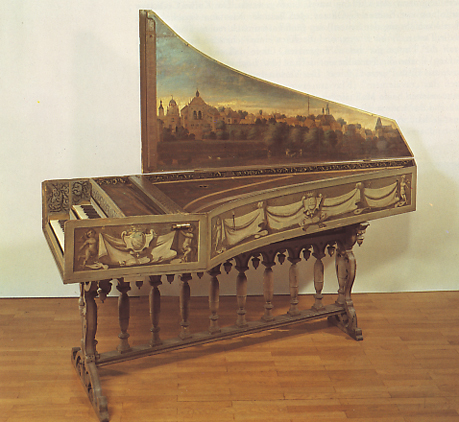 The harpsichord was used first of all as an accompanying instrument by professional musicians (continuo players), but also for solo literature. 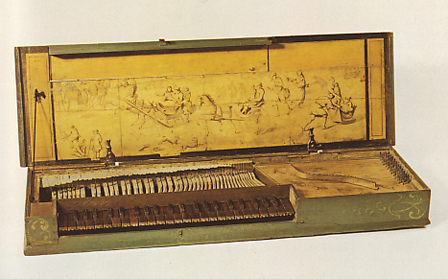 The clavichord was at first mainly used as a studying instrument. Only late in the 18th century the clavichord started to get its own literature, especially in northern Germany. 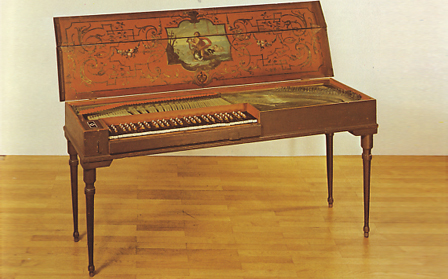 Wealthy families were able to own harpsichords, spinets, virginals and muselars in their own households. Some of them even owned a house organ. At around 1800 the piano took over the role of the harpsichord and clavichord very suddenly and a new group of users was added: the bourgeoisie. The piano is suitable for a wide repertoire of very wide-ranging musical styles like Viennese Classicism, German Romanticism, French Impressionism, late classical, jazz, pop etc. The piano has a rich solo literature for one or several pianists, for one or several pianos and for piano and orchestra. 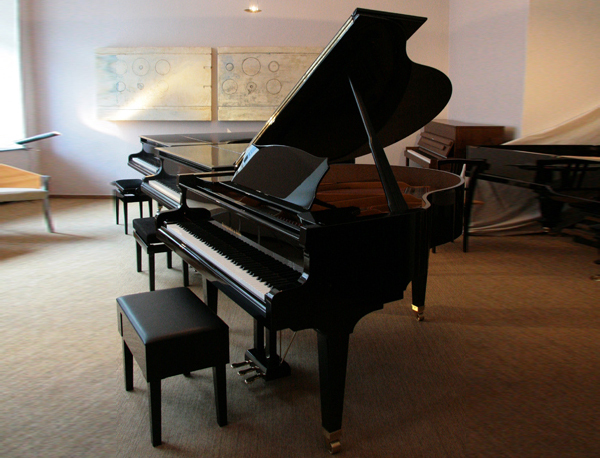 The piano plays an important part in the chamber music, in duo-, trio- or quartet play. Sometimes we also hear the piano as an orchestra instrument. The pianist is often used for accompanying a vocalist, singers and choirs as well as a tutor for ballet. That, which the piano has in common with other keyboard instruments, is the fact that the whole western tone system is clear to see “in front of the eyes”. The tone system is close enough to touch. The modern piano also possesses thereby over the total range of 6 octaves. Such a situation invites to improvise and edit compositions of renowned composers for the piano. Pieces, which were originally composed for an ensemble or orchestra: piano abstracts and piano edits emerge. This is what makes the piano so incredibly good as an aid for harmonizing and composing. Kees Rosenhart (*1939; Haarlem, Netherlands) was the organist of the Waalse Kerk (Waalse church) in Haarlem for a long time, where he played on the Friederichs organ from the year of 1808. In the seventies and eighties he was active as a main subject lecturer for the harpsichord. In the time before, he taught at the music schools in Kampen, Hilversum, Haarlem and Beverwijk. He studied at the former Amsterdamsch conservatory the main subjects harpsichord under Gustav Leonhardt and organ under Albert de Klerk. Kees Rosenhart is an author of the Amsterdam Harpsicord Tutor. About the performance practice of old music, he published regularly in various journals. He is one of the founders of the Nederlands Clavichord Genootschap and one of the initiators of the Haarlemse Clavecimbeldagen, which take place twice a year. For the association “Stichting voor en met orgel” (foundation for and with the organ) he produced records of important historic organs in and around Haarlem together with Wim Husslage, from the Müller organ in Beverwijk and of the organ in Oosthuizen, the oldest organ in the Netherlands. In the past twenty years he concentrated on the keyboard instruments of the 17th and 18th century, especially on the organ, clavichord, harpsichord and the fortepiano.